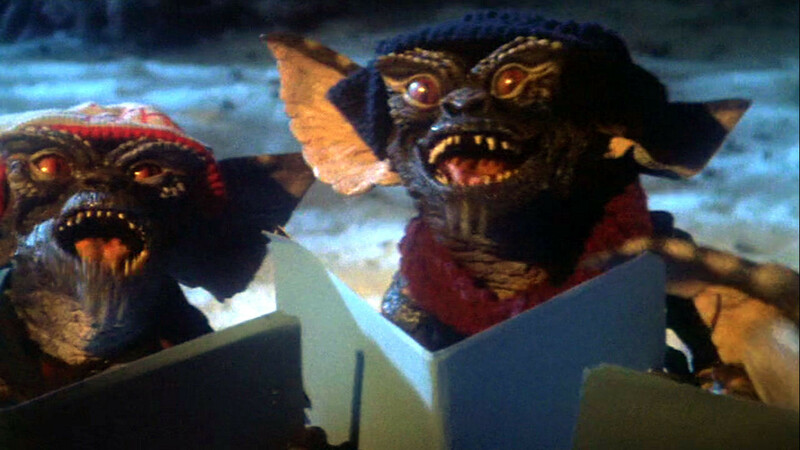 Joe Dante practically invented the Christmas Horror movie, but with Gremlins the fact that it’s Christmas — or for that matter, a horror movie — takes second place to his particular satiric vision. Gremlins is crammed with social satire and commentary from first scene. Over the opening credits, the first thing an attentive viewer may notice is that most of the sets are modeled after, “It’s A Wonderful Life,” a point that’s driven home even more by the fact that the town is “run” by a miserly old woman who loves to screw people over around the holidays. (Of course, it’s only more appropriate that the mother in this film is watching “It’s A Wonderful Life,” on TV, as if to further de-construct the 4th Wall in film viewing, and to serve as a “Life As Art, Art As Life” counterpoint to that particular angle.) If that weren’t enough, Gremlins‘ own version of George Bailey is introduced immediately, seeing as how the town’s greedy miser has got it in for not only him and his family, but his little dog, too. But beyond the thematic and film allusions, it’s not until the Mogwai comes home that the social commentary begins. As a typical complacent family of the ‘8Ø’s, it’s much easier to get wrapped up in their own lives than meet the needs of the family pet, a not-so-subtle jab at the problems with child-rearing in America. Christmas itself serves a particularly important focal point when it comes to pointing out our shortcomings: It’s as if this small-town family is so distracted by material needs and the superficial aspects of Christmas, that the forces of nature throw a plague of Gremlins on the town in an almost biblical fashion. And then the real fun begins. To complicate the layers upon layers of poignancy, the Gremlins themselves seem to be attracted to junk culture, violence, and the flotsam and jetsam of the ‘8Ø’s. The more they are exposed to these inclinations, the more the second and third generation beasties become more disgusting and easier to distract. Weather it’s a steady stream of beer coming to keep them docile or having them watch a movie to make them happy, it seems as if the Gremlins themselves amplify the very character traits that caused them to exist in the first place. More jabs at child-rearing, since the “parent” Gremlin seems less affected by these problems, though not entirely. But when all is said and done, Gremlins is more a form of demented slapstick a la The Three Stooges. When push comes to shove, they think they have all the rights in the world to be as lazy and disgusting as they want, and will gladly defend those rights in the most silly and hilarious ways they can muster. But like most junk-culture addicts, the Gremlins feel their rights involve over-indulgence at all costs, and in the end it becomes their very undoing. When the soft and cuddly marketing tool of the film finally dispatches the final villain, it’s only fitting that an Asian Gentleman judges the family that stars in this movie. He leaves little to recommend this — or any — American family, and claims that they are not ready for responsibility of this kind. Is it more film allusions, or a comment on the opinions of foreign powers regarding typical Americans? In Joe Dante’s world, it’s all the same, so long and the pace is frenetic and the jokes crud and funny. And personally, I wouldn’t want it any other way.